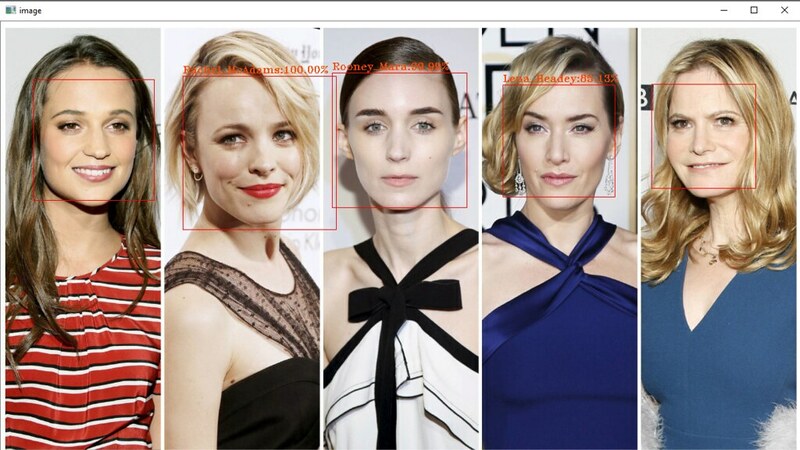 Last time we tried VGG Face at previous post to display face recognition in one picture, this time we improve it, detect multiple face in one image and recognize them. Here I will use Haar Cascades to do face detection, you can also download other feature-based cascade classifiers at here. Let's see the code, most different part was here. We using Haar Cascades - Face to get face location, and crop it as a list for later use. Result display part has a little difference too. First for-loop n<prob.Height was for how many faces. 2nd for-loop i<prob.Width was for 2622 identities. This time we draw name on image only if confidence over 50%, because if we input face not in VGG Face Dataset, the confidence should be low, so we skip it. If we don't skip them, you will see wrong name with low confidence like that. And here is the test result. In my opinion, those two test shows how to detection face in image and recognize them, if you want to implement it into surveillance system should be not so hard, I know it need more work to make it better, but at least it is a good start. BTW, If you think 2622 identities not enough, you can try VGGFace2 Dataset, it got 9131 identities. Or you can get it from my github. I bought a copy of this pen for my friend at this online store. replica mont bl anc meisterstueck My friend likes it. The pen is very smooth,replica mont blanc fountain pen almost no different from the original, I like it very much.